You know: “The Good Old Days.” You remember. I suspect each generation can recall a decade or a year (or a month or a day or even a place) when/where the things that are annoying or troublesome or frightening about today were NOT happening (or at least did not seem so annoying or troublesome or frightening in our memory). Do you have a memory of such a time — a time that you remember as being better than today in some way? I bet you have some images in your mind that represent what was better about that time. Were the people better, more reliable, more friendly, smarter? Were the choices available to you more appealing back then? Easier to achieve? Less of a struggle? More fun? Did stuff make more sense to you? Were those times really better? People my age (the ‘baby-boom’ generation) like to talk about the 1950s and early 1960s, remembering it as a time of stability and simplicity, when music was more harmonious, when post-war America was expanding its prosperity and influence in the world and building lots of shiny new things — cars and highways, and buildings, and corporations, and … stuff. Maybe we remember that we liked our neighborhood better somehow. 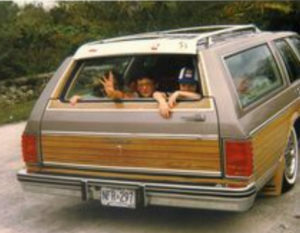 Some of us remember the time before seat belts, riding in the back of station wagons and pick-up trucks. It was a time when there weren’t so many rules; but I guess we don’t want to think about the danger we were in every day. 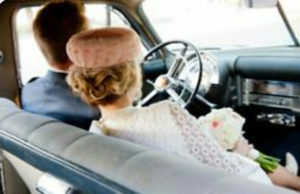 Seat belts started showing up at the end of the 1950s and many of us actually started using them in the mid-1960s. 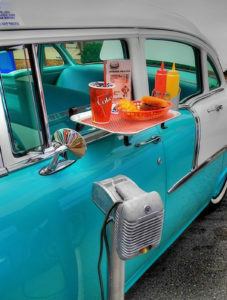 Before any of us cared about cars, here is how you found your friends in the neighborhood in the 1950s. Here, they’re all down the street at Kelly’s (he had a swimming pool). Me? OK, I hung out at Fosters Freeze. 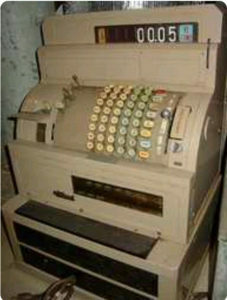 Surely you remember when every business had a cash register like this one on the left? 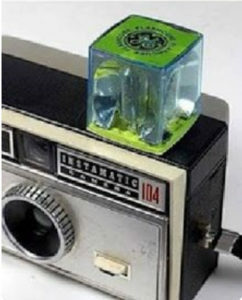 Maybe you started using an Instamatic camera with flash cubes to take photos around 1963? (It used film — remember film?) 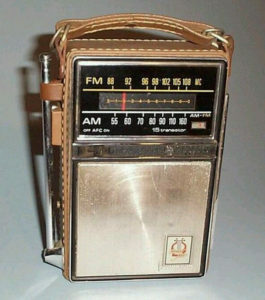 But, most important of all was the transistor radio, above on the right. 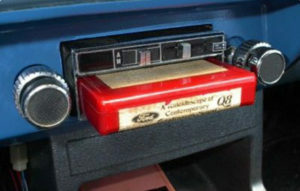 I’m sure you, like me, listened to the San Francisco Giants (as described by Russ Hodges and Lon Simmons) on one of these. And, on Saturday mornings, I listened as Emperor Gene Nelson counted down the Top 30 songs on KYA. Then in the late evening on KYA, Big Daddy Tom Donohue played those same songs and read commercials for Clearasil (the Acne Cream). He would sign on at the beginning of his show with these words: “This is your Big Daddy Tom Donohue. I’m here to clear up your face and mess up your mind.” No fooling, he actually said that every night — don’t you remember? Those are some of the things that I remember about that era. I claim that “The Fifties,” the fabled time of stability, predictability and good times, lasted from 1950 until November of 1963. After that, troubling, unexpected things started happening — or maybe I just became more aware of a wider world with more complexity and danger than I had seen before. I learned that America was in a mortal struggle against The Soviet Union who, we were told, wanted to kill us all with nuclear weapons because they believed that we wanted to kill them with those same weapons. When we practiced diving under our desks at school in the event of a nuclear attack, I became painfully aware that the wider world was a threat to us right here in my town. On the evening news, Walter Cronkite starting telling us some very disturbing things including the fact that my hero at the time had been murdered on the streets of Dallas. When I showed up in high school in 1964, I began to learn that wars were brewing all over the world and Americans not much older than me were being sent to fight in those wars. I learned that while I was having my stable and secure childhood in my peaceful California town, others in my own state lived in towns that had bloody race riots. The only people of color I met growing up were the housekeepers who worked for my mother and basketball players who played for Pittsburg High School in the town next to ours. I wondered why there were no Black students in my high school and none seemed to live in my town. It wasn’t until 1968 — about the time that Martin Luther King and Robert Kennedy were murdered — that I learned that a class-action lawsuit had been filed against realtors who had conspired to make sure that no Blacks moved into Antioch. I remember being shocked and embarrassed as I packed up to go away to college. Every day, it seemed, there was more distressing news and I became increasing aware that my own stable and peaceful life was an exception, not the rule, and I was living in the middle of troubled times across my country and around the world. Waiting? What Might We Learn? These are the good old days. These are the good old days. I take her advice to suggest that we have to invest in THIS day. I observe that there is much to like about today — I am surrounded by people who matter to me and who make my life matter. If today is not what we want it to be, we, along with those close to us, have the responsibility to make it better. My conclusion? The past and the future are both flawed. THESE are the only “Good Old Days” we get. Maybe they’re only as good as we make them. 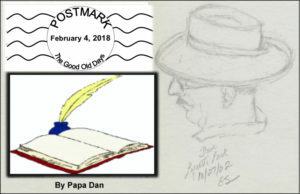 Monday, February 5th, 2018, by Daniel and is filed under "Ideas, Who We Are ". You can leave a response here, or send a Trackback from your own site. I couldn’t agree with you more. The past is gone and the future is not here yet . Now is all we have to work with. We can build a better future by what we do now, but now is all there is. The rest is a memory or an anticipation. So live, love and laugh and don’t look at the stock market for a while. If you (the collective you) can, retire. It is a delightful way to live in the present. Make every day a good day. I would like somehow to recapture the feeling of optimism of years past, also the feeling of personal safety and security–remember the days of not having to lock up your house at night or your car doors when you went shopping? of smiling at people as you passed them on the sidewalk or offering or asking for help from strangers without fear that you would be assaulted? I think our young people would be better for a free-range childhood like was possible in the 50s and 60s, where you hung out with face-to-face friends and where bullies couldn’t do their dirty work in cyber anonymity. I certainly don’t want to turn back the clock, but there are definitely some aspects of the “good old days” that we would be better for reclaiming, if only we could figure out how to do that. In the meantime, onwards…to fight new battles (and fight again old ones), to take again and again that first step of the longest journey. Thank you for another interesting trek down memory lane! On initial reflection, “The Good Old Days” were the mid to late 1960’s. It was a time of innocence and freedom for me. Neighborhood mom’s stayed home and packs of kids played outside after school. My brother and I could always find a group of like minded mischief makers. 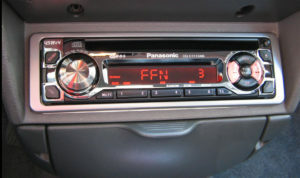 Then there was the music! The Rolling Stones, The Beatles, Simon and Garfunkel, Aretha Franklin, The Supremes, Bob Dylan, Ray Charles, Sam Cooke, Janis Joplin, Cream, BB King. I will stop there, but I could type fine musicians for another 20 minutes. Did any other time have so much notable music? Apollo 11 had landed on the moon! However I was 10 in 1968. I also remember “Duck and Cover” drills, TV coverage of the war in Vietnam, and the assassination of Martin Luther King. “The Good Old Days” don’t stand up to close scrutiny. On a purely selfish level, regardless of what is going on in the wider world “The Good Old Days” were when our families were still with us. 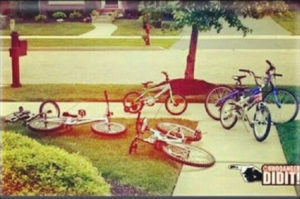 Those were absolutely the best of days. We just didn’t realize it then. I received this from my mom, who is 90 (I don’t know where she got it). age cohort. We are the Silent Generation. We are the smallest number of children born since the early 1900s. who can remember the winds of war and the effect of a world at war that rattled the structure of our daily lives for years. from gas to sugar to shoes to stoves. We saved tin foil and poured fat into tin cans to use later. We saw the ‘boys’ come home from the war and build their little houses. With no TV, we spent our childhood playing outside, on our own. the war sandwiched in between westerns and cartoons. Computers were called calculators; they only added and were hand cranked. Typewriters were driven by pounding fingers and manually throwing the carriage, inserting sheets of paper, and changing the ribbon. Newspapers and magazines were written for adults, and the daily news was broadcast on our table radio in the evening by Gabriel Heatter. Pent-up demand for goods coupled with new installment payment plans put factories (and people) to work. New highways brought jobs and mobility. Our parents were suddenly free from the confines of the depression and the war. They threw themselves into exploring opportunities they had never imagined and were busy discovering the post-war world. 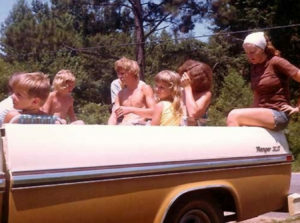 We were not neglected, but neither were we the all-consuming kid/family focus. Our parents were glad we played by ourselves until the street lights came on and it was time for supper. We entered a world of overflowing plenty and opportunity, a world where we were welcomed. 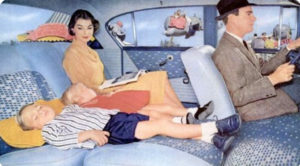 We enjoyed a true luxury–we felt secure in our future. Nonetheless, depression-era poverty was deep rooted. Polio was still a crippler. Russia built the “Iron Curtain,” and China became Red China . Eisenhower sent the first U.S. “advisers” to Vietnam. perpetual economic insecurity had yet to haunt life with unease. war and a time when our world was secure and full of bright promise and plenty. We have lived through both. the world was getting better. not worse. We are the last ones and our days are numbered. At 85 years of age, my good old days are more long ago than yours.I prefer the days getting from then til now, even tho ‘nowadays’AREN’T PERFECT.